In the last article of this series, “Living a Missionary Life,” I gave a brief summary of what living in Papua New Guinea was like for us as a family. Those were good years, and in many ways our family has looked at those years as the best years for our family. We were a solid family unit the four of us, living in our house in the tropical forest in the remote village ministering to the Papuan people by day and having many wonderful family times together in the evenings. Just before we returned to PNG in 2000 after a short furlough to visit family and our supporting churches, we built a crate (4′ x 4′ x 8′) to send overseas thinking that we would spend the next 10 to 15 years over there working on the Bible translation project. This is what I had always dreamed about doing, what I have trained for, and what I was prepared to give my life for in service to God. Little did we know what lay around the corner for us. Now I do need to admit that living in our remote village was not easy. I think of all of us, Glen was the one who enjoyed village life the most. Partly because of his young age but also because of his personality he fit in well. Our older son Eric on the other hand, has always been more suited to larger cities and more Western-style living. And that’s okay, because God makes all of us uniquely different. So shortly after our return to the field, Eric began asking us for our permission to let him go up to the highlands of PNG to live on a large mission base where he would live in a dormitory and attend an international junior high/senior high school. It was very difficult for us as parents to consider the idea of him living apart from us, but over time we came to realize this would be a better arrangement for Eric. In August of 2001, our family went up to the mission base and begin a new phase for our family. At first, our family all stayed together in one flat (apartment) in the house that PBT owned up there. Then Eric moved over into one of the hostels where other schoolchildren and the dorm parents lived while Jill, Glen, and I remained at the PBT house. The idea was to have us close but to still allow Eric a trial period of separation to see how he would do living at the hostel. And you know what? Eric really enjoyed living there and going to the mission school for his 7th Grade. Actually, I think it was much harder on us to let him go than for him to leave us. This looked like it would work out well, and so the three of us headed back to our village in the lowlands. Thankfully, we did have a radio connection between our village house and the hostel so that we were able to talk to Eric almost every day. The first hint of a problem was when Eric got sick on a school outing and couldn’t shake it off after more than two weeks of feeling poor. At the same time, some troubling cultural issues developed among the villages of our language group and so the Directors of our Branch advised us to go back up to the mission center. So our family was reunited, but Eric continued to have throat and bronchial problems as well as feeling very weak. We worried for our son, but the clinic doctors kept thinking that it was simply a bacterial problem. We were now getting ready to go back to the village but Jill asked the doctors to run one more test on Eric. Now whether that was Jill being a very concerned mother or was prompted by God I don’t know, but the fact remains that this one more examination proved vital for Eric’s health. When the two doctors finally got together and reviewed the results, something suspicious in the blood work caused them to call us in so that they could talk to us. Being medically trained, Jill caught on much faster than I did as to the potential seriousness of the situation. The next thing I knew we were calling our health provider back in Canada and were advised to take Eric to Australia for more testing. That afternoon and that evening is still a blur. Phone calls were made, neighbors watched over the kids, and friends came to help pack up all of our belongings from the house where we were staying. The next day we loaded up on the small mission Cessna airplane and headed towards Port Moresby, the capital of PNG. By the next day, we were in Brisbane and Eric was immediately admitted into the hospital. We got the unofficial word that night, and were officially told the news the next day. Eric had leukemia. Even as I dictate this story into my computer microphone my voice gets choked up, and my eyes get misty with tears. As much as I love living in Papua New Guinea, putting my hand to the task of translation and being in service for the Lord, my love for my family was greater and my heart and my spirit were broken that day when we received news of his diagnosis. That day in January of 2002 began a long cancer journey for Eric and our family. The chemotherapy treatments went on for 30 months, and Jill and I lived with the fear of the disease and the worry about the treatment during those months. But we entrusted the life of our son into the hands of our Father above. 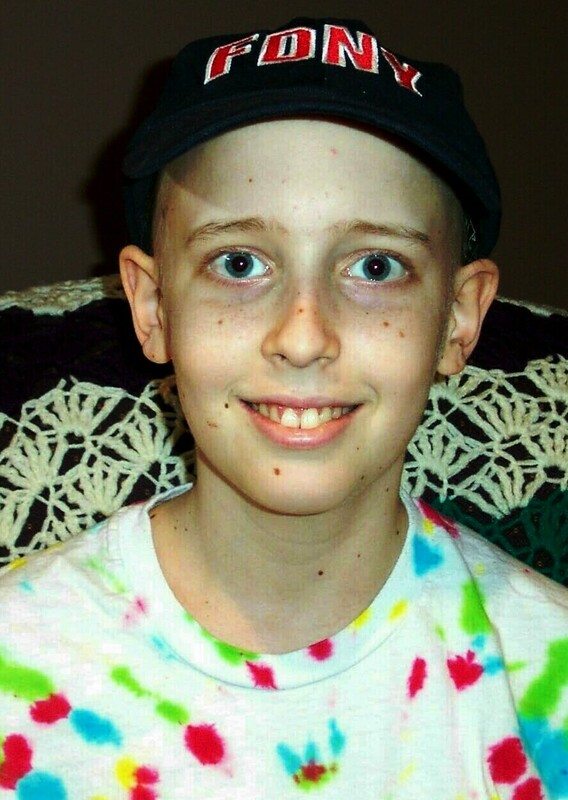 And in His mercy, God watched over Eric and brought us all through those cancer years. There is so much more to the story that I cannot tell right now, but I will, Lord willing, in future articles. In all those years, I never remember saying, “Why Lord?” But I do remember often asking God, “Please Lord, spare the life of my child and give us strength to walk this path.” Looking back now, I’m happy to say that God answered both of those prayers.